Tradition takes us back, again and again. It's a runner's reward. Ah, the weekend morning group run. It can be the ultimate motivator to keep up with your training program. After all, you don’t want to be sucking wind at the back of the pack. For many groups, the run is followed by a trip to a local diner or pub for some more camaraderie. But if you order the wrong edibles from menus that are often chock full of nutritional villains, you could easily cancel out all the calorie-burning hard work you just put in. Here’s how to navigate the menu to make the most of your nutritional recovery. After you finish a run, your top priority should be to replace the fluids lost through sweating so your body can get back into proper water balance. 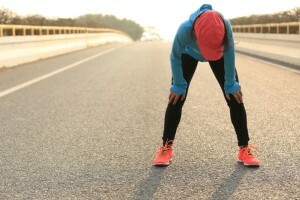 The importance of making sure the table is full of liquid assets is even more vital when you take into account that runners typically only replace no more than three-quarters of their sweat losses through drinking during exercise. As soon as the group is seated, ask for several pitchers of water – following a run, try and consume at least 16 ounces (2 cups) of it. More if you’re run was longer than one hour and/or it took place in sultry conditions where sweat loss was substantial. It’s easy to forget to chug water when you’re busy socializing and wolfing down grub. After every couple of bites of food, make it a habit to take a gulp of liquid. Diners are increasingly offering this ancient beverage. Sipping the antioxidant-rich brew may knock out free radicals known to delay muscle recovery. When the waitress arrives with a mug containing a tea bag and water, don’t hastily remove the bag. Letting green tea steep for three to five minutes ensures that more antioxidants end up in the water. A study in the International Journal of Sport Nutrition and Exercise Metabolism reported that downing chocolate milk post-exercise resulted in a faster recovery than a carbohydrate sports drink. The drink you loved as a kid has the ideal amount of fluids, carbohydrates, and protein tired muscles need. Steer clear of calorie calamity milk-based shakes, which can derail your diet. Many menus include vegetable juice among its drink choices. Flush with a variety of recovery-promoting nutrients and antioxidants in a concentrated package, 100 per cent vegetable juice is an easy, tasty way to get a serving or two of vegetables. And those gleaned mostly from tomatoes will have ample amounts of lycopene, a powerful antioxidant that a British Journal of Nutrition study suggests can protect muscles from strength-sapping oxidative stress resulting from exercise. Yes, most are fairly high in sodium, but take advantage of this after a run when you need to replace sodium lost in sweat. A 2008 Journal of Applied Physiology study reported that when endurance athletes combined carbohydrates with a high dose of caffeine after exercise they accumulated 66 per cent more muscle glycogen than when only carbohydrates were consumed. Caffeine appears to trigger a greater increase in blood glucose and insulin levels, which brings more sugar into muscles to make glycogen. Because of the demands running puts on your carbohydrate stores, searching through the menu for good sources of carbohydrates to replace spent muscle glycogen is a must. Just steak and eggs isn’t going to cut it. A 2009 University of Texas study discovered that eating cereal with skim milk (available on most diner menus) immediately following two hours of aerobic exercise was just as effective at stimulating muscle glycogen and protein synthesis as a carbohydrate-electrolyte sports drink. This makes sense because cereal provides lots of carbs, and low-fat milk is a source of good quality muscle-repairing protein. Another smart combo to order if available on the menu is yogurt and granola. With significant levels of carbohydrates, a plate of flapjacks can help reload your muscle glycogen stores. It’s still difficult to find whole grain pancakes and breads at eating establishments, but if there was ever a time to eat refined grains it would be after exercise. The white flour used to make most pancakes elicit a higher insulin response which, under normal circumstances, is not a good thing, but post-run, this spike causes the rapid uptake of carbohydrates into the muscle. Waffles and French toast are other carb-heavy options. Instead of smothering them in butter or whipped cream, try using a moderate amount of pure maple syrup and a generous heaping of fresh fruit. As a side dish or dessert, fruit salad is almost always a great thing to order. Some studies suggest that antioxidants found abundantly in fruit may speed post-exercise muscle recovery. Plus, fruit has a wealth of potassium, an electrolyte that is lost in sweat along with sodium. Spuds are jam-packed with high-glycemic-index carbohydrates to help reload your muscle fuel stores. Like fruit, they also contain an abundant amount of potassium. To keep them healthy, avoid dousing mashed potatoes with butter, sour cream or gravy. A safer option for your waistline is to request some tomato-based pasta sauce and use that as a topping. Hash browns and home fries are generally cooked in copious amounts of oil making them an iffy choice at best. Runners tend to be drawn to carb-rich pasta and almost every menu has a pasta option or two. Avoid pasta dishes that are laden with cream sauces or the iconic mac ‘n’ cheese, which is often a calorie bomb thanks to the copious amounts of cheese. To boost your antioxidant intake, request that an extra serving of veggies be mixed into the pasta. Research shows that combining protein with carbohydrate in the first hour or two after activity ramps up the insulin response, which results in more stored glycogen. The optimal carbohydrate to protein ratio for this effect is roughly four-to-one. Protein also provides the amino acids necessary to rebuild muscle tissue that is damaged during running. The amino acids can also stimulate the immune system, making you more resistant to the sniffles. Here’s a reason to indulge in a little gastronomic patriotism. Made from the loin cut, which is in the centre of the pig’s back, peameal bacon is significantly leaner than conventional bacon, but with all the same muscle-friendly protein. Ham is also an excellent protein option. Eggs are back in favour, having been rehabilitated from their undeserved bad rap as artery-clogging waste of calories. The high-quality protein eggs bring to an omelette will help mend your muscles – plus research suggests that eggs make a meal more filling, so you’re less likely to raid the cookie jar when you get home. Whether you order eggs scrambled, hard-boiled, sunny side up or as an omelette, make sure to request that they’re not cooked in butter. Sandwiches made with lean meats such as turkey breast, chicken breast and roast beef can deliver a dynamic duo of carbs and protein at once. Try to get it stuffed with as many vegetables as possible. A slice of cheese won’t do much harm, but avoid bacon and coating the bread in mayo or gravy. Fajitas and burritos can be a healthy option as well if they are packed with more protein (e.g. eggs, chicken, beans), veggies, salsa or avocado instead of cheese and gooey mystery sauce. You can’t go wrong with a hearty bowl of chili loaded with nutritious beans. The powerful bundles of protein, carbohydrates and antioxidants offer the added nutrition runners need. With the necessary protein and carbs, lowbrow chicken noodle soup can be an important element of a recovery meal. As a bonus, you also get a good amount of liquid to aid in rehydration. Soups with beans are another good choice, but to avoid cream-based versions. This healthy twist on a diner classic has the required protein and carbohydrates to recharge your muscles. It’s tasty enough and so easy to whip up, you may find yourself running right past the restaurant for your kitchen. Place potatoes in a saucepan and cover with water. Bring to a boil and cook until potatoes are just tender, 5 to 10 minutes. Drain and cool. Cut into small cubes. Heat oil in a large skillet over medium-heat. Add onion and sauté until translucent, about 4-5 minutes. Add the potatoes and continue to sauté until golden brown, about 10 to 12 minutes. Meanwhile, preheat the broiler. Combine tuna, shallot, mayonnaise, cilantro or parsley, lemon juice, celery, curry powder, hot sauce, salt and pepper in a medium sized bowl. Spread the mixture on the two slices of toast; top with tomato slices and cheese. Place sandwiches on a baking sheet and broil until the cheese is bubbling and golden brown, 3 to 5 minutes. Season potatoes with salt, pepper and paprika, and mix in parsley.